Nifty opened down on the back of bad global cues and went on to touch 4884. The responsive buyers came in and moved the index well over 4900 but were unable to close above the dotted line. It was a slow and gruelling expiry with price not moving much till the afternoon session. The index ultimately closed the day at 4924.25 a loss of 26.50. The new series has just 1.43 Crore OI, which is less than normal. The initial range developing is 4700-5100 for the time being. Call option 4900-5500 added 47.1 lacs huge amount of OI. Put Option 5200-4500 added 35 lacs huge amount of OI. Highest accumulation on Call option 5000 at 38.7 lacs & 5300 at 35.1 lacs whereas Put option 4500 at 57.1 lacs & 4800 at 49.6 lacs. Nifty Open Interest is at 1,43,50,700 up by 26,32,250 with decrease in price, all rolled over from previous series, most probably shorts. Bank Nifty Open Interest is at 19,52,700 up by 2,52,575 with decrease in price, all rolled over from previous series, most probably shorts. FII’s sold huge 24.74 lacs of Futures most probably huge long liquidation, as their OI also decreased by 1.8 Crore, and their average price per contract comes to around 4809. 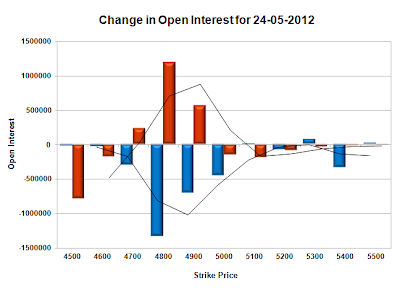 PCR Open Interest (Volume) at the start of the series is at healthy 1.489. 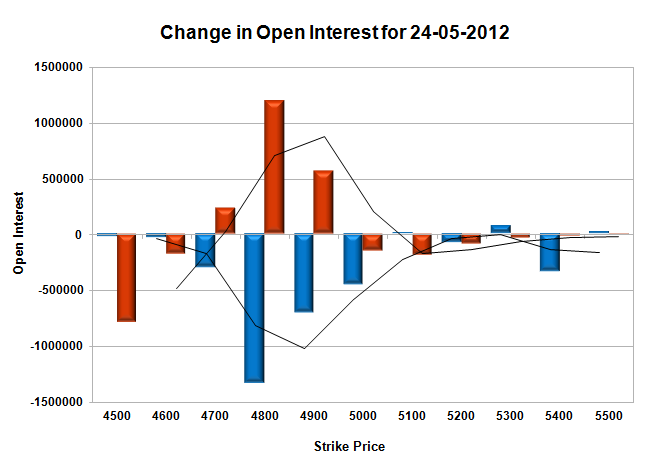 Support for the series developing around 4800, and below that at 4500 with highest OI of over 57 lacs. Resistance is right now at 5000 and above that at 5300 with OI of over 35 lacs. Range as per Option Table is 4863 -4977 and as per VIX is 4859 - 4989 with 4940 as the Pivot. Nifty opened well below the dotted line and remained weak for the entire session, Bulls tried to move the index above the previous day’s close, but was sold off to the day’s low at 4950.75 a loss of 39.35. Again good rollover was seen today with June Series adding 21.6 lacs open interest. The Option Table saw huge addition at 5000CE which seems like the ceiling for this expiry. 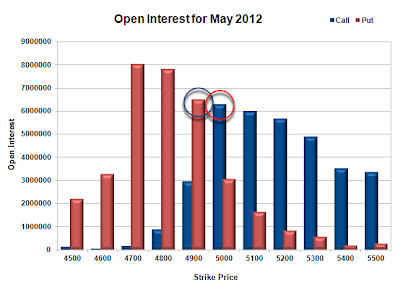 Call option 4900-5000 added 9.16 lacs huge amount of OI, with huge profit booking seen at 5100 and above strike prices. 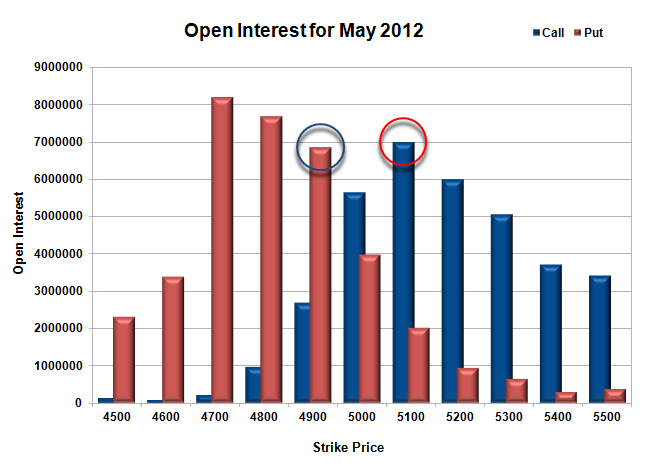 Put Option 4800 added 1.45 lacs huge amount of OI, with huge short covering seen at 5000 and above strike prices. Highest accumulation on Call option 5000 at 62.9 lacs & 5100 at 60 lacs whereas Put option 4700 at 80.4 lacs & 4800 at 78.2 lacs. Nifty Open Interest is at 1,46,47,000 down by 16,42,300 with decrease in price, whereas June series added a huge 21.6 lacs, most probably 100% rollover and huge short build-up. Bank Nifty Open Interest is at 12,36,350 down by 2,31,925 with decrease in price, whereas June series added 3.43 lacs, most probably 100% rollover with huge short build-up. FII’s sold huge 4.42 lacs of Futures most probably shortl build-up, as their OI also increased by 20.3 lacs, and their average price per contract comes to around 4740. 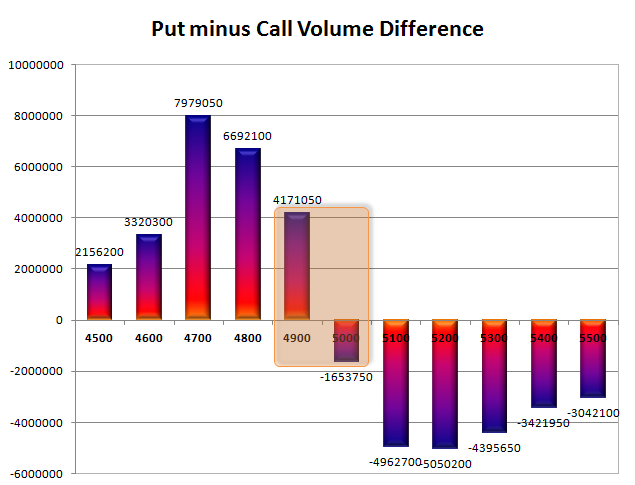 PCR Open Interest (Volume) dipped to 0.938 due to huge covering of 5000 and above PE levels. Expiry support at 4900, with OI at 65.2 lacs and below that at 4800-4700 with OI of over 80 lacs. 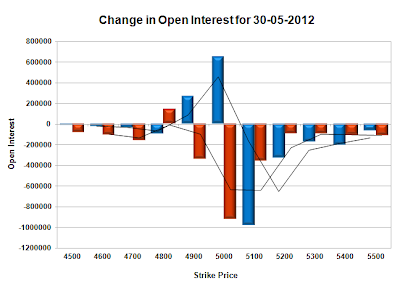 Resistance is at 5000 with highest OI of 62.9 lacs and above that at 5100 with highest OI of 60 lacs. 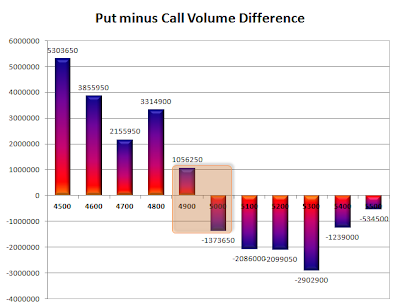 Range as per Option Table is 4901 - 5014 and as per VIX is 4885 - 5016 with 4970 as the Pivot. Nifty opened flat and carried on the momentum from yesterday to touch 5020, but strong selling around there pushed the index back to the previous day’s level. Nifty closed flat at 4990.10, a small gain of 4.45 point. Good rollover was seen today with June Series adding 20.2 lacs open interest. The Option Table saw huge addition at 5000-4800PE with 4800 now the base. Call option 5100 added 4.97 lacs huge amount of OI, with huge short covering seen at 4900 and below strike prices. Put Option 5000-4800 added 18.7 lacs huge amount of OI, with huge profit booking seen at 4700 and below strike prices. 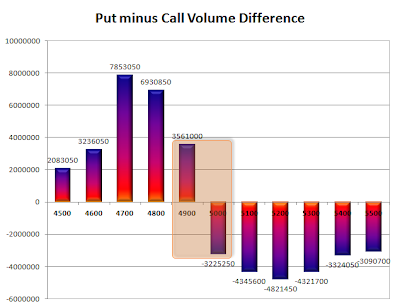 Highest accumulation on Call option 5100 at 69.8 lacs & 5200 at 60 lacs whereas Put option 4700 at 82 lacs & 4800 at 76.8 lacs. Nifty Open Interest is at 1,62,89,300 down by 15,19,450 with not much change in price, whereas June series added a whopping 20.2 lacs, most probably 100% rollover and huge long build-up. Bank Nifty Open Interest is at 14,68,275 down by 3,67,175 with increase in price, whereas June series added 6.1 lacs, most probably 100% rollover with huge long build-up. FII’s bought huge 4.74 lacs of Futures most probably long build-up, as their OI also increased by 10.03 lacs, and their average price per contract comes to around 4782. PCR Open is increasing by the day and now at 0.979, due to huge addition seen at 5000-4800PE Level. Support at 4900 got cemented with OI now at 68.6 lacs and below that at 4800-4700 with highest OI of 85.8 lacs. Resistance is weakening at 5000 with OI decreasing by another 3.8 lacs and above that at 5100 with highest OI of 69.8 lacs. 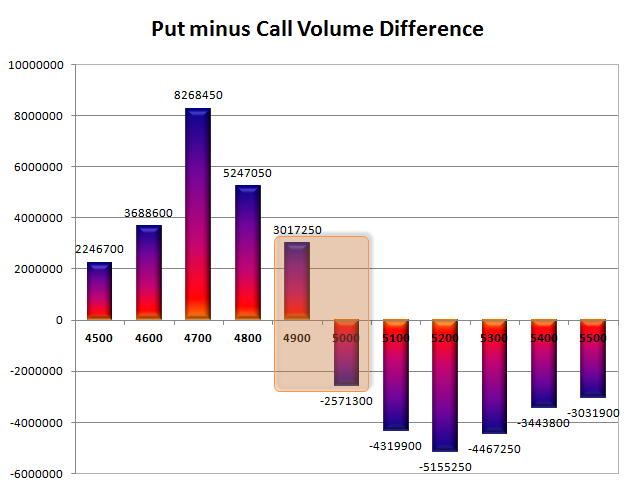 Range as per Option Table is 4935 - 5054 and as per VIX is 4927 - 5053 with 4980 as the Pivot. Nifty opened strong on good global cues and carried on its up-move till the end of session to close strong at 4985.65, a huge gain of 65.25 point. Good rollover was seen today with June Series adding 24.2 lacs open interest. The Option Table saw huge unwinding at 5000-4700CE. Call option 4700-5000 covered 30.3 lacs huge amount of OI, with small profit booking seen at 5300 and above strike prices. 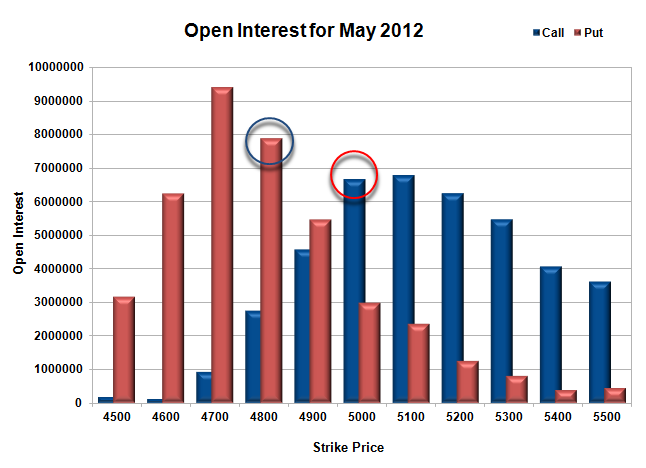 Put Option 5000-4900 added 17.6 lacs huge amount of OI, with huge profit booking seen at 4800 and below strike prices. 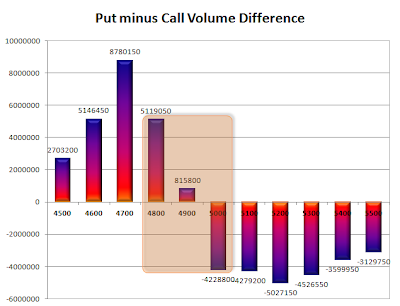 Highest accumulation on Call option 5100 at 64.8 lacs & 5000 at 60.3 lacs whereas Put option 4700 at 85.8 lacs & 4800 at 67.6 lacs. Nifty Open Interest is at 1,78,08,750 down by 10,86,750 with increase in price, whereas June series added a whopping 24.2 lacs, most probably 100% rollover and huge long build-up. Bank Nifty Open Interest is at 18,35,450 down by 5,53,825 with increase in price, whereas June series added 4.3 lacs, most probably huge rollover with huge short covering. FII’s bought huge 1.78 lacs of Futures most probably long build-up, as their OI also increased by 19.09 lacs, and their average price per contract comes to around 4765. PCR Open increased to 0.936 due huge short covering seen at 5000-4700CE Level. Support now has shifted to 4900 with huge addition of 9.2 lacs today and below that at 4800-4700 with highest OI of 85.8 lacs. Resistance is still very much there at 5000 though it covered huge OI of 8.2 lacs and above that at 5100 with highest OI of 64.8 lacs. 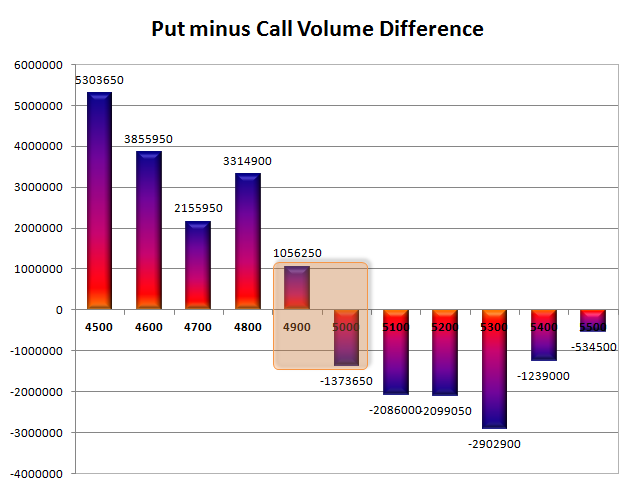 Range as per Option Table is 4910 - 5035 and as per VIX is 4924 - 5047 with 4960 as the Pivot. After the huge rally of yesterday, Nifty opened weak around 4900. After the initial dip below 4900, Nifty rallied to 4935 and closed the day at the 4920.40, with a loss of just 1.00 point. Some more nifty OI were covered today. The Option Table saw huge profit booking. 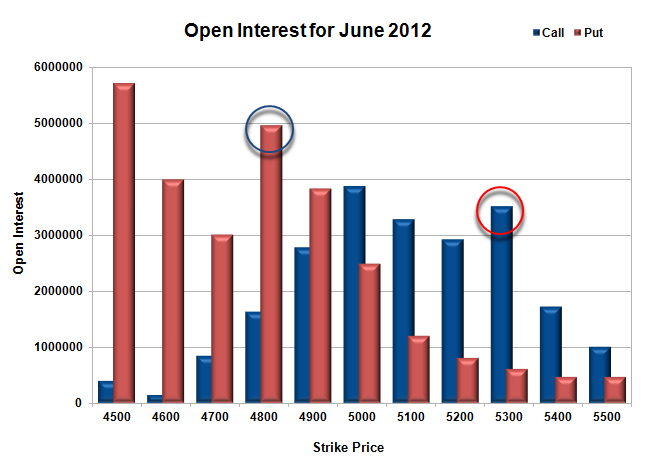 Call option 4900-5000 added 3 lacs huge amount of OI, with small profit booking seen at 5100 and above strike prices. 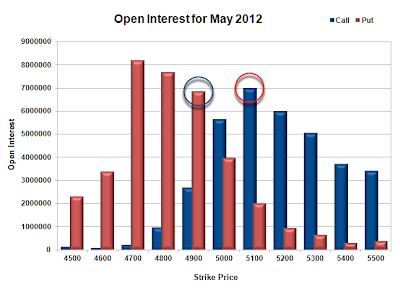 Put Option 5000-5200 covered 6.2 lacs huge amount of OI, with profit booking seen at 4600 and below strike prices. 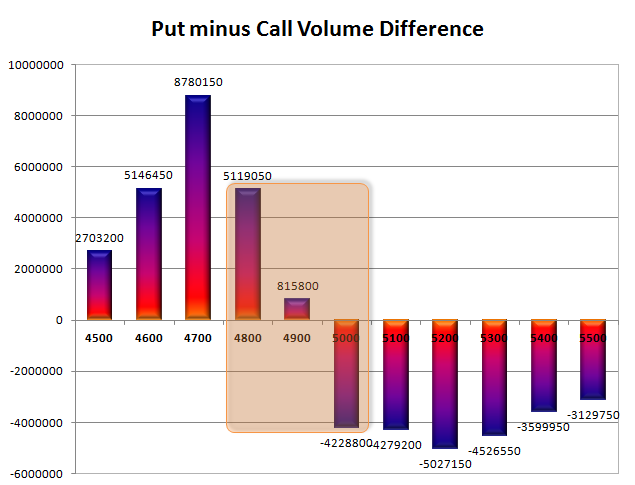 Highest accumulation on Call option 5000 at 68.5 lacs & 5100 at 65.2 lacs whereas Put option 4700 at 93.7 lacs & 4800 at 72.7 lacs. 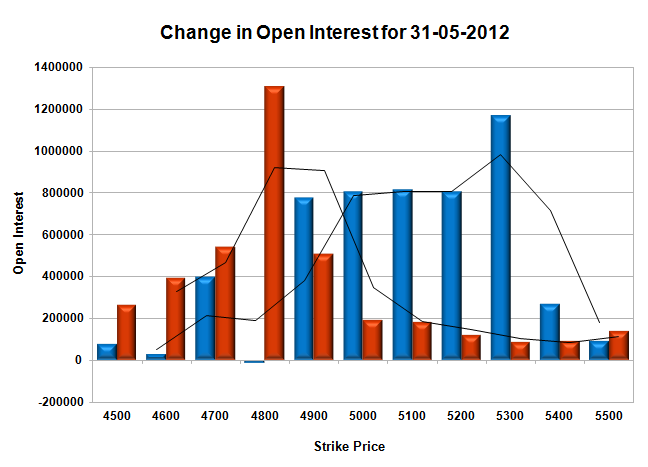 Nifty Open Interest is at 1,88,95,500 down by 3,50,000 with no change in price, most probably huge short covering. 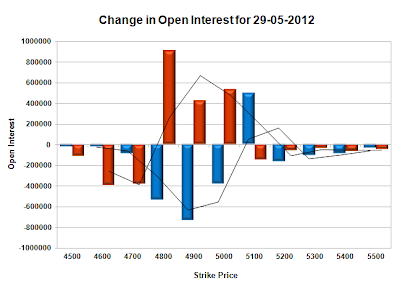 Bank Nifty Open Interest is at 23,89,275 down by 89,400 with increase in price, most probably huge short covering. FII’s sold huge 8.35 lacs of Futures most probably huge short build-up, as their OI also increased by 1.08 lacs, and their average price per contract comes to around 4693. FII’s have sold around 1.06 Cr of futures from 2nd May till date. PCR Open decreased to 0.907 due huge profit booking at 4500-4600PE Level. Support remains at 4800, though covered some OI but still above 72 lacs and below that at 4700 with highest OI of 93.7 lacs. 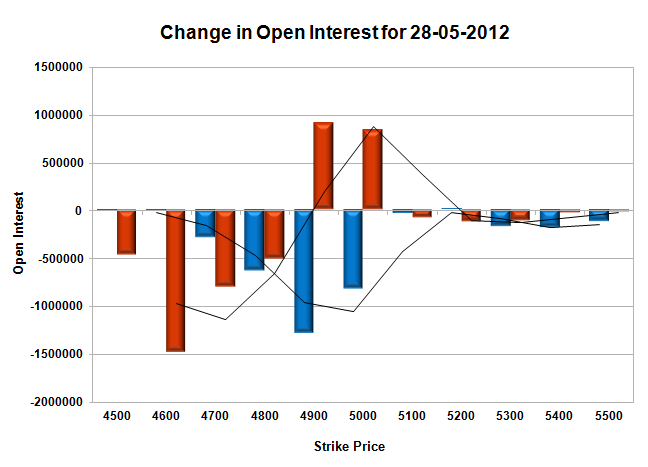 Resistance is still very much at 5000 with highest OI of 68.5 lacs and above that at 5100 with huge OI of over 65 lacs. Range as per Option Table is 4855 - 4979 and as per VIX is 4856 - 4985 with 4900 as the Pivot. Nifty opened flat and when it seemed like, we are in for a dull range bound day, and the index took off to touch 4900 by noon. A small dip towards 4850 was promptly bought into, and the index closed the day at the 4921.40, the high point of the day with a huge gain of 85.75 points. 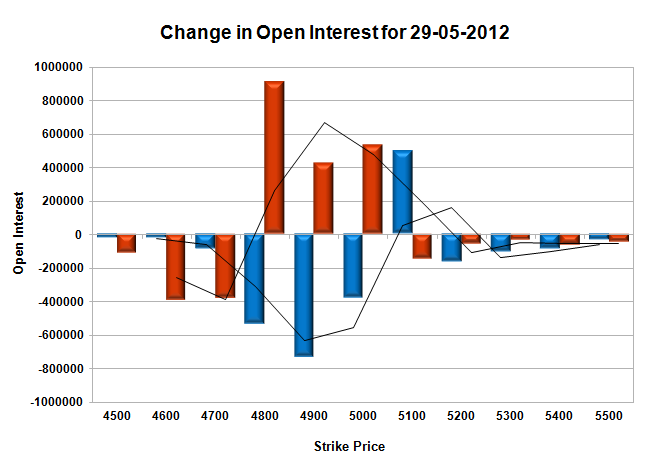 Looking at the Nifty OI, it looks like the rally was based on short covering. The Option Table saw huge-huge addition at 4700-4900PE and 4700 level now looks like a solid base for this expiry. Call option 4700-5000 covered 27.9 lacs huge amount of OI, with small profit booking seen at 5400 strike price. Put Option 4700-4900 added 19.9 lacs huge amount of OI, with liquidation seen at 5000 and above strike prices. Highest accumulation on Call option 5100 at 67.7 lacs & 5000 at 66.7 lacs whereas Put option 4700 at 94.1 lacs & 4800 at 78.9 lacs. Nifty Open Interest is at 1,92,45,500 down by 12,30,350 with huge increase in price, most probably huge short covering. Bank Nifty Open Interest is at 24,78,675 up by 1,00,375 with increase in price, most probably huge long build-up. FII’s sold huge 13.3 lacs of Futures most probably huge short build-up, as their OI also increased by 9.32 lacs, and their average price per contract comes to around 4690. 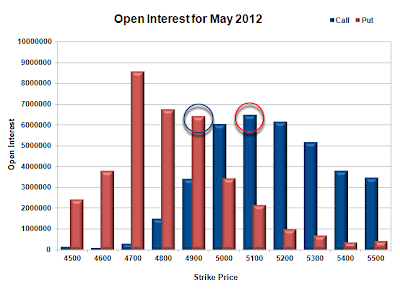 FII’s have sold around 1.05 Cr of futures from 2nd May till date. PCR Open Interest has jumped up to 0.935 due to huge liquidation at 4800-4900CE. 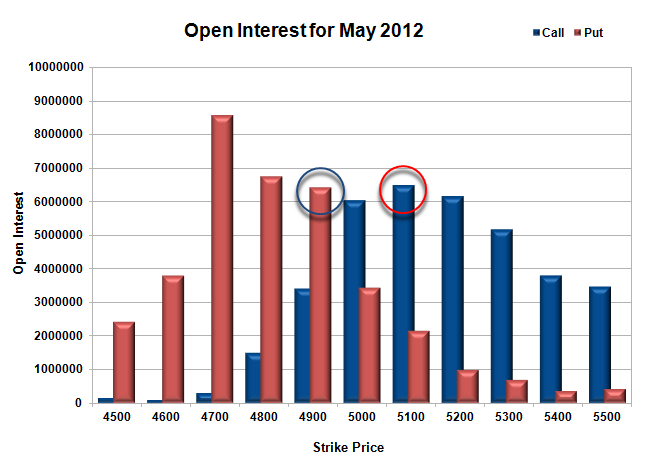 Support at 4800 got a huge prop with addition of 11.9 lacs OI and below that at 4700 with highest OI of 94.1 lacs. 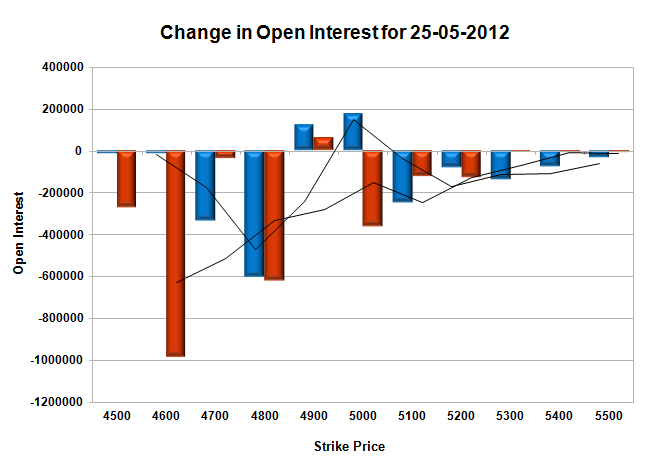 Resistance is right now at 5000 with OI of above 66.7 lacs and above that at 5100 with highest OI of over 67.7 lacs. 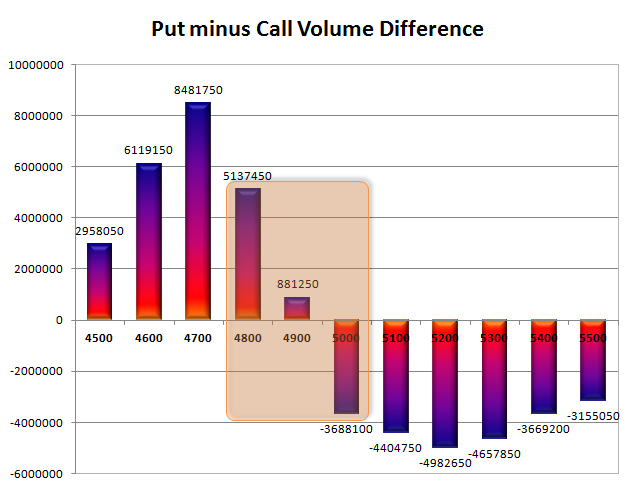 Range as per Option Table is 4839 - 4965 and as per VIX is 4856 - 4987 with 4900 as the Pivot.